Coconut and peanut butter are two of my favorite foods. But, when you combine them to create these No Bake Peanut Butter Cookies, I now have a new favorite food! If you're at all a fan of both or either of these ingredients you should do like we do and make a couple batches, store them in the fridge, and have high fat, keto friendly drops of heaven at all times of day! The easiest Peanut Butter Cookie You'll Make! ​This is our easiest and quickest recipe yet, which you would normally think is a great thing, right? Well, it can be a little dangerous, especially with the no bake aspect allowing you to eat them quicker! Be sure to store them in the back on the highest shelf so you don't see them every time you open the fridge. Maybe you'll forget about them, if that's even possible. There are a bunch of different routes you can take with this recipe and whatever you have on hand. You can swap the crunchy peanut butter out for a smooth one and even use shredded coconut instead of the big flakes like we did. You can add nuts or chocolate chips and even press the dough out into a pan and cut it into squares for a better presentation! All we did here was give you the base of your new favorite recipe hehe. I think a no bake recipe is something to always have on hand for those times you have to whip up something quick. However, peanut butter recipes should be endless, which is why we think you should give our Low Carb Peanut Butter Pie and Chocolate Peanut Butter Cake a try! However, if I'm being honest, nothing is creamier and more indulgent than these no bake peanut butter cookies! 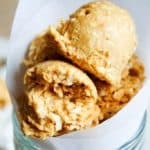 Recipe can be quickly added to MyFitnessPal - Search "KetoConnect - No Bake Peanut Butter Cookies"
Combine all the ingredients above in a bowl and combine with a spoon. Place the bowl in the freezer for 10 minutes. Once the mixture has slightly hardened, use a cookie scooper or a spoon to scoop out 7 equally sized cookies. Store in the fridge for up to 1 month or freeze for up to 3 months. Enjoy!